... and that is definitely true in the case of this issue’s Profile article. Our Editor asked Kent-based Wedding DJ Iain Baker to write down his DJ story all the way back in March 2015 and it has taken over two years to coax an article out of him! However it was worth waiting for, as Iain’s funny and engaging piece not only tells his own tale of turning a passion for music into a DJing hobby and then – years later – a full-blown career, it also offers lots of advice for others who’d also like to take the plunge to become a full-time DJ. Iain has promised to contribute more articles to future issues of Pro Mobile... hopefully we won’t have to wait another two years for the next one! 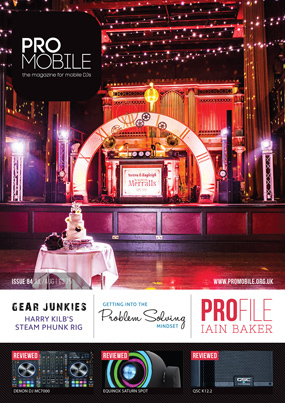 Of course there’s plenty more articles to delve into in this issue, covering all kinds of subjects related to mobile DJing. These range from Euan Bass’ piece on setting your prices, to Tony Winyard’s ideas on the importance of perception, and Richard Lee’s article about classic tracks that started out as B-sides to other single releases. Add in reviews of the latest sound and lighting equipment and there should be plenty of interest for all mobile DJs from experienced veterans to those who have only just started their DJ journeys. Mark Walsh asks, "In its search for professionalism, has the mobile DJ industry lost its personality? Eddie Short, Euan Bass, Fabio Capozzi, Greg Cartwright, Iain Baker, James Humphrey, Mark Walsh, Richard Lee, Richard Linton, Toby Oakley, Tom Wellingham and Tony Winyard.